There are few things more fun than cycling with your kids, especially when they’re in front of you so you can talk as you ride. A baby giggles, gurgles and squeals at all of the sights and probably the dynamics of cycling as well. With a toddler the communication is obviously more intellectually stimulating. P1 (2.5 yrs old): “Papa, papa… Taxi, blue Land Rover jeep winch, two motorcycle! Thaaaat’s funny. No helmet racing bicycle! Playground! Slide. Go to plaaaayyyyy ground!!! Plaaaaaayyyyy ground!!! 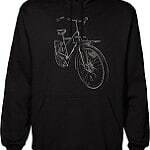 !” Still, nowhere is P1 more motivated to articulate complete concepts than on the bike. I expect the same will be true for P2, except probably with girl topics instead of our current mini gearhead talk. Both P1 and P2 began riding in the Cargobike at about a month old (in a Maxi Cosi secured in the box) and then moved to sitting on the bench at about nine months old. P1 absolutely loved watching the world go by from the Maxi-Cosi and even at just a few months old was happy (or sleeping) for rides up to a couple hours long. P2 on the other hand, just didn’t like riding until she could sit up. Of course she still went in the bike almost daily for errands, to the daycare, to friends etc but we didn’t even bother to try a longer ride with her. It was clear it would just be too frustrating. 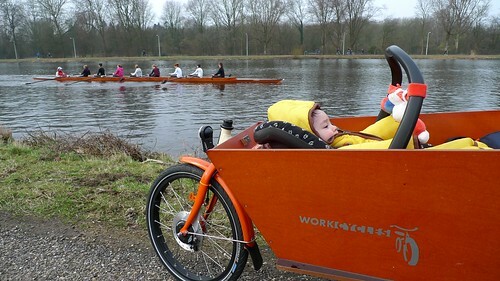 P2 (10mo old) began to enjoy cycling about a month ago when she began to sit either in the child seat behind the handlebars of our Fr8, or on the bench of the Cargobike. She sits in the same support seat we used for P1 (the shell of a Bobike Mini), mounted on the right side of the bench. Now, she’s clearly enjoying herself, smiling, squealing and waving her arms as we ride. It’s also a lot more convenient not having to bring the Maxi-Cosi along and it’s freed up lots of room in the box for other stuff: P1’s tiny bicycle, picnic gear, or perhaps everything the family needs for a few days on the road. With P2 now enjoying the ride and the spring weather appearing it’s time to get back to the long bike rides through the countryside we so enjoy. Last year we did a number of quite long rides with P1, even bike touring a hilly area of France with him between my arms. But having two kids makes everything more complicated so first a little mini-tour to refine what we need to bring along, figure out how far we can ride and how much we have to stop and just plain old see whether it’s still fun. 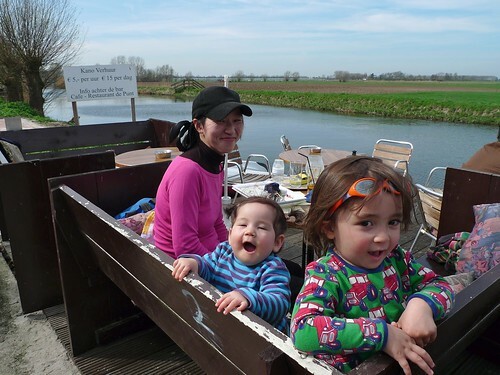 So last weekend I escaped my usual Saturday shop duties for a weekend family bike tour. We figured 50km to be a reasonable distance and there are fortunately interesting routes and destinations in practically every direction. The weather in these parts is notoriously fickle at this time of year so going much further would be akin to asking the gods for a day of force 5 headwinds blowing a steady rain into our faces for the return trip. A bakfiets is probably only marginally more aerodynamic than a barn door and it doesn’t fit in the train for a shortcut home so we played it safe. Lage Vuursche, a village in the “Utrechtse Heuvelrug” (a wooded area with some small hills in the middle of the Netherlands) was chosen as destination, a hotel reservation for Saturday night made and the bikes checked over thoroughly. 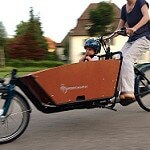 I would ride the Cargobike with the two kids and most of our stuff. 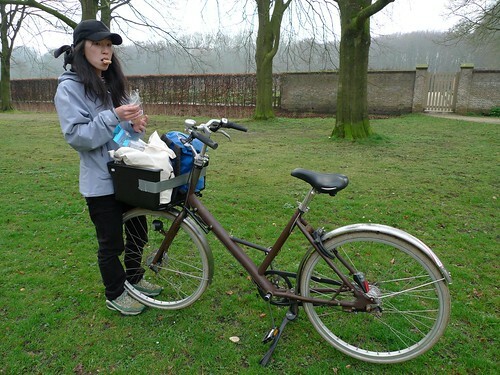 Kyoko would ride our Fr8 city bike with just the snacks (lots of them!) in the bin on the front carrier. Coincidentally I found a clean sheet of eggcrate foam just big enough to line the floor of the bakfiets box. A little trimming and it fit perfectly. P1 was on hand to test our “instant bed” and approved… immediately taking a nap in the box. The gods smiled upon our plans and blessed us with a beautiful Saturday and a forecast of a rainy but warm Sunday. I can live with that. A nice big breakfast, comfy clothes on, everybody smeared with the first sunscreen of the year and off we began our little adventure. With a warm day ahead we didn’t want the bakfiets canopy greenhousing the kids so I wrapped it up with a small tie-down strap and stowed it under the bench. Not bringing a rain canopy in the beginning April would be very dumb! Loading up the bikes I couldn’t help but note the sheer volume of stuff we were bringing: We filled the bakfiets box and the bin on the Fr8. In retrospect I shouldn’t have been surprised; It was mostly just clothes, raingear and other light, soft items just loosely packed in bags instead of being tightly stuffed into panniers. We brought a small sleeping bag along for possible picnics, to wrap the kids in if it got cold or for napping in the bak. And anyway we are packing for a family of four, mostly in one bike. It wasn’t long before the first stop was necessary: An unhappy P2 turned out to be a hat that’d flopped over her eyes. P1 wanted his sunglasses, which he mostly wears pushed back on top of his head. Riding with little ones you just have to accept and enjoy LOTS of stops. First major stop was for a snack and playtime along the Waver river. Here we also had a lovely talk with an older couple heading the other direction on their own weekend tour. 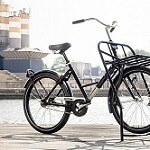 Yes, bike touring is very popular in the Netherlands, particularly amongst those of the “empty nest” age group. Scrutinize this picture carefully; It’s the only one with me in it. A great thing about this area is that we can ride almost endlessly on such paths. We’re only about 10km from Amsterdam but you wouldn’t know it from the scene. An hour or so later it was lunch (and play) time. We stopped at a great little cafe along a river in the village of Baambrugge. P1 enjoyed until it dawned on him that we wouldn’t be going canoeing like those who glided past: “Caaaaanooooooo!! Caaaaanooooooo riiiiide!!! !” and so he screamed, writhing and kicking while I secured him in the bakfiets again. 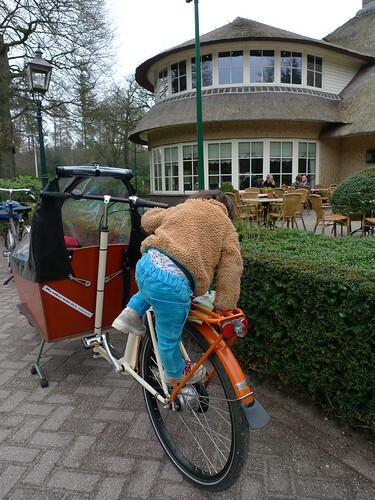 This is the main reason the bakfiets has harnesses, more so than protection in the unlikely case of a crash. Of course he calmed down again after a few minutes but continues to ask about going canoeing. I’m stalling by telling him he needs to first learn to swim. Another hour or two further (I don’t keep track of such things nor do we have computers on any of our bikes) we escaped the paved world entirely, riding on smooth dirt paths through a nature preserve. Here P1 points out the obvious to us. Probably already six hours “on the road” at this point the kids are looking pretty fried. No more hamming it up for the camera. And a little while later they’re both lights out. P2 can rest her head against the clothes we’ve stuffed behind her head but P1 is doing the nodding thing, waking himself up. We rearrange some baggage, make a little nest with the sleeping bag and plop him in there. We’re less than 10km from Lage Vuursche, entirely on these perfect dirt paths so the danger factor is exceedingly low. The mostly elderly guests at our rather posh hotel didn’t seem to know what to make of this bike riding family with two free-range tikes. I think we scared them away from this patio. Interestingly, even in the Netherlands, even in an area extremely popular amongst cyclists… there was no bike rack at all at the hotel and we seemed to be the only guests who’d arrived by bike. Lacking any more obvious option we just parked the bikes on the patio and nobody complained. Sunday morning was cooler, foggy and wet but not really raining; perfect cycling weather in my book. Still it was cool enough to better have the kids out of the wind so the canopy went up, and stayed up the whole day. In case you’re wondering the black tape on the canopy window covers a couple little holes caused by the two times the bike was tossed over into the canal by the wind. …asleep. With the canopy up they sleep better because the corner of the canopy works perfectly to nestle their heads into. Unless we lived in a desert or tropical climate I couldn’t fathom not having this canopy. So we did actually go to a castle (thus fulfilling the promise!) but the kids unfortunately slept through it. It’s probably just as well since this castle was also “closed”, with no signs of opening times or anything. At least we could get up close and I got to take a nice photo. Oh, in case you’re wondering what bike Kyoko was riding here she is, snacking in front of the castle. It’s just my current daily ride: a Fr8 with a random collection of parts I’ve been testing. It’s now a three speed with drum brakes front and rear. 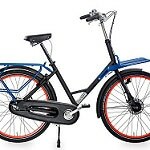 A Nu Vinci infinitely variable hub and the latest Shimano roller brakes will be installed soon for their long term test. The bin on the front carrier is cut away because there’s usually a child seat behind the handlebars and bin (fixed to frame) would otherwise interfere with the footrests (that turn with the handlebar). A couple strips of duct tape keep the bags from falling out the back this weekend. Nope, you don’t need a special bike to go touring and I know lots of folks here who’ve done far more ambitious rides on far more basic bikes. When the kids woke up a while later it was play, snack and coffee time again. Here P1 demonstrates why a rock-solid parking stand (and strong spokes) are important. He climbs up, sits on the rack and insists we ride like this just like he sees the big kids and adults do all the time. No, not yet kid – certainly not on a bike without any foot/skirt guards over the rear wheel. About halfway home (different route, even more nature reserves) we encountered an odd obstacle for the Netherlands. This gate was locked with a padlock. Usually these are just secured with a latch since (I assumed) they’re to prevent large animals from passing through. 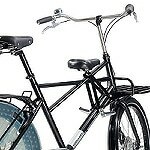 A standard size bike can be squeezed through the chicane with a little maneuvering but not a 2.5 meter long 40+ kg bakfiets. 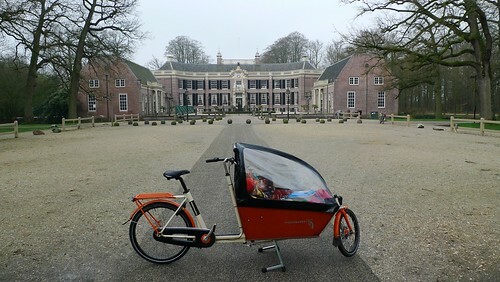 Fortunately a very sweet older couple helped us lift the bakfiets over the gate (without the kids inside!). The gate at the other side of this area just had a latch as usual. The ride through this nature reserve (first image above in this post) was worth the little hassle though. It’s a very beautiful marshland. The rest of the ride home was equally scenic and peaceful: a warm lunch at a village cafe, a good playground to let the kids work off some steam and dinner at a favorite restaurant in Ouderkerk aan de Amstel. Finally we rode home with full tummies as it was getting dark and quite cold. The sleeping bag came out again to cover up the kids who of course fell asleep for the last leg. It was a great trip and many handy lessons were learned for future editions. 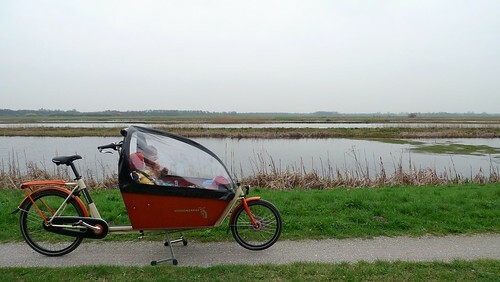 But the basic format of touring from home with the kids in the bakfiets and Kyoko on a simple city bike works perfectly. The distance of 50-60km seems about right. Much further would just take too long with all the stops required. Hopefully we can choose a new direction and get out for such a ride each month or so while it’s warm. 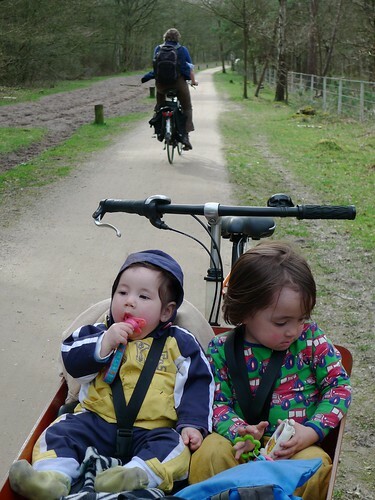 This entry was posted on Monday, April 11th, 2011 at 11:00	and is filed under Bikes in use, Child and family transport, Henry and his family, Practical cycling. You can follow any responses to this entry through the RSS 2.0 feed.You can skip to the end and leave a response. Pinging is currently not allowed. Nice trip. But as regards Drakensteyn: the house was bought in 1959 by the then princess Beatrix who had it restored and moved in in 1963. It remained her family home until she succeeded as queen, when she moved to the official residence in 1981. Drakensteyn has been a private holiday home for the queen since. Now that it seems that abdication is near, Drakensteyn has again been refurbished (local papers wrote unkindly that it has now got provisions for elderly people), and the entire estate has been surrounded by a robust fence, much to the chagrin of the neighbours. The general idea is that Beatrix will move there when her son becomes king and then either moves to Huis ten Bosch in The Hague, the official royal residence, or stays on in Wassenaar. Drakensteyn is a purely private property and not open to the public, not even the gardens. And as for the padlocked gate: I suspect that the lock is there to keep people in cars out. 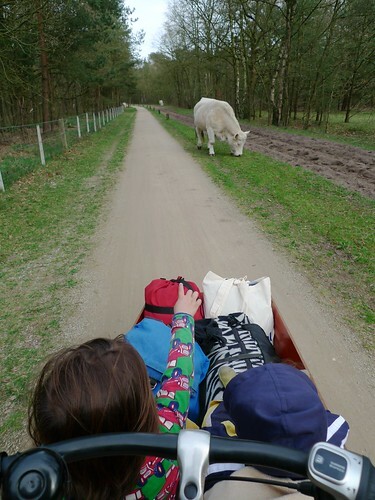 Ask Staatsbosbeheer who have to resort to the same measure to keep SUVs out of their forests. Regarding the padlocked gate, the current model of the Smart Car is 269cm long. Since the longer bakfiets is 255cm and considerably narrower it should not be difficult for that fence to be modified, whilst still keeping all cars out (The original Smart Car is 250cm). I assume that you can just go to the appropriate website in your country and request it, right? @Todd: Another pest are motorbikes, in particular the all-terrain kind, and quads. 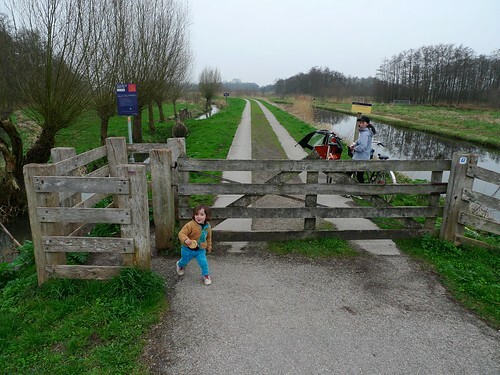 I suppose that if the gate is modified to let a bakfiets pass, motorbikes would also easily go through. Recently a badger sett in a nature reserve in Wapserveen, Drenthe, not far from Assen, was found demolished by people using it as a ramp for jumps on ATB’s and quads. The badgers – protected species – were smart enough to move elsewhere. The culprits were found to be teenage boys, the kind that always says there is nothing for them to do. And really, they had no idea. Now that they have been banned from the reserve, a roll of barbed wire was found a few days ago, stuck into the sett’s entrance. People and nature don’t always go together well. And then sometimes harsh measures are required. Thanks for this charming writeup. 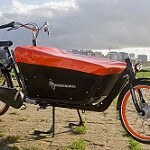 I think your 50-60km distance sounds just right for a cargo bike. I did double that on my little trip, but every day was a slog and I never got to stop to visit anything at all. Brent, When solo touring I really enjoy that endless flow of scenery and rarely stop except to look at maps and to get more food and water. But with the family it’s completely different. Perhaps this will also change my preference for solo cycling as well. @Frits B: Thanks for that. I suppose it is good argument for using the Dutch Army to protect your country’s fragile natural assets rather than to contribute to endless and unwinable crusades to protect the over-mobilitied’s rights to lithium for private electric vehicles. Can you really squeeze the canopy in such a small space without damaging it? It’s been great to ride with kids without the canopy on some warm spring days (even here in Finland), but in the morning it’s still too cold. So I’ve been trying to figure out how to pack it. Yes, the fiberglass canopy stays are almost unbreakable so I’ve found a way to sort of fold/roll it up and then wrap a pair of small tie-downs around it. Then the canopy can easily be stowed under the other baggage. Do make sure to secure it well because the stays have considerable spring power so it could cause some pain if it accidentally gets loose. When you say you “folded up the rain canopy and put it under the seat” how did you do that? Did you just take out those bendy things? Whups…I see you have already answered my question. Do you happen to have a video of the wrapping up of the canopy? Hi Anja, No I don’t have such a video, sorry. But there’s no need to remove the flexible poles. The process is just as I described above. I actually just secure it with a single strap but two straps would be safer. 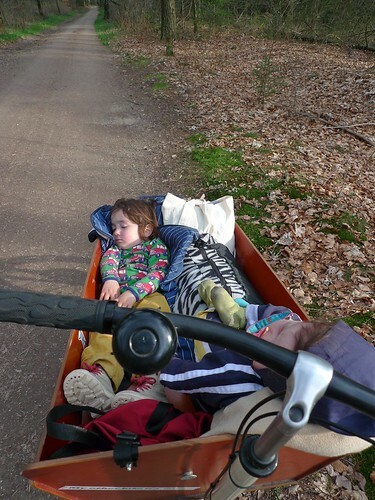 After 6 months of riding a bakfiets in London I must say I regret not buying the cabrio version of the canopy. With the weather changing every half an hour or so it’s a bit of a pain having to stow away the full canopy which takes away lot’s of space. Henry have you had any experience with this type of canopy? Is there any better, more spacious alternative? We’ve sold a handful of the Cabrio canopies but not with the most encouraging results. A couple customers are happy with them and a couple are not. For these changing weather situations we prefer just using the flat cover with the snaps on the sides. In raincoats with hoods pulled up and tucked under the cover the kids stay dry in a shower. And it folds up to toss in the box when not needed or when there’s too much stuff in the box for it to fit. Thank you Henry. It seems there’s room for improvement in the canopy – while the flat cover is nice, the canopy protects much better from the elements. 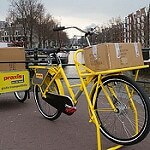 And ideal for me would be one that’s more like those on Christiania bikes shapewise, where you could unzip the middle section, fold it, and then just rotate the sides downwards around the edge of the box, where you could secure them with the elastic – this would also offer much more space for cargo. 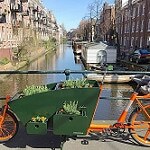 Yes, we’re well aware of the need for some more canopy options and will be trying to work these into the development of the our cargobike in the works. We’lll check out doing both a sun canopy and a stow away canopy. Of course one often doesn’t know what weather to expect before heading out so a single canopy that does all these thing would be ideal. Problem is that it’d be fairly complex, perhaps not so tough and nobody will be willing to pay for it. David, There’s currently no sun shade for the Cargobike though as I mentioned in an earlier comment it’s a consideration. Each summer we get a few requests but thus far not enough to warrant production. 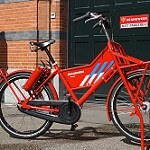 95% of the Cargobikes are sold in the NL where it just isn’t sunny and warm so often. In the past I’ve made my own simple conestoga wagon (Christiania type) style canopies. I modeled the shape of the bows in cardboard and then cut a plywood mold to bend aluminium tubes to shape. The bows were then bolted into the box walls and a canopy from suitable material sewn to fit. If installed with loops or tunnels you could slide the canopy back and forth as needed for best shade and ventilation. There are mesh type materials specifically designed to shade sunlight while allowing air to flow through. Henry, Thanks very much for your speedy reply. It’s understandable that there just isn’t a high enough demand for the type of canopy we’re looking for. At the moment we have a Leggero baby seat, meant to be used in the Leggero child trailers, fixed to the base of the box as our daughter isn’t quite big enough to sit on the bench yet. We have a “Kiddopotamus Stroller Rayshade” that was given to us as a gift from Australia to increase the amount of shade in a baby stroller, which is made of a very fine mesh material that allows air flow. It’s just about possible to strap it to the box, shading her head and upper body, her legs and feet are slightly exposed but for the moment it’s the best we’ve got. This solution wouldn’t work if the child or children were to sit on the bench but if they are close to the floor it works. Thanks very much for the tips and I’ll be looking into making one of those conestoga wagon style canopies. 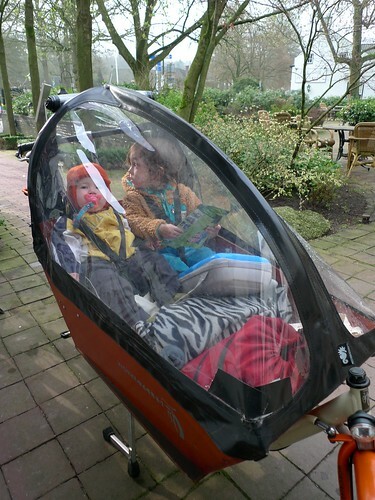 About the baby car seat… How is it secured to the bakfiets? Is there any suspension or cushioning under it? We have a two-month old to transport. The question of a sunshade comes up periodically though probably not enough to justify production. Certainly if you’re handy with patterns and sewing your plan is a good one. Being no expert in that field my impression is that it’d be quite tricky to copy that pattern accurately without disassembling the original canopy. A simpler route would be to just buy a second canopy and then remove and replace the clear windows with the mesh material. Of course that would be more expensive and heavier since the tough, waterproof material is unnecessary. Nice blog. This is my first time here. As for the padlocked gate. Yes they are designed to keep cattle in or out. In see them a lot, but mostly on footpaths. 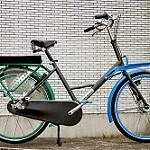 I like the bobike mini seat arrangement. 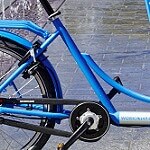 Please can you tell me how you attached the bobike seat to the bench? The Bobike Mini is first cut up: footrests removed, a little of the right armrest removed, Bobike harness removed. Then we drill a hole in the steel plate underneath that matches the original hole in the bench for the harness. Use the harness that comes with the bike, not the harness from the Bobike. We usually fit the toddler seat on the right side since that’s the child more likely to be hanging an arm or leg out of the box and it’s the side of the bike away from passing cars. Where people drive on the “wrong side” you could do it on the left instead. Henry, do you have any good photos of that foam toddler seat? I’d like to fashion one on my own but all the photos I see online are teeny tiny avatars. Which foam toddler seat are your referring to? I ended up making a very rudimentary one out of 4″ thick cushion stuffing. I’ve just got it covered with a pillowcase now but I’ll make another cover out of cloth diaper backing before it’s maiden voyage in a few months. Have the issues with the cabriolet hood been solved? 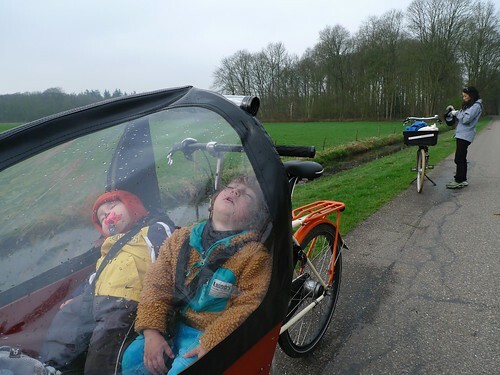 I live in Hull, UK and the weather is very changable…..
Karen, The Cabrio tent isn’t a Workcycles design or product and as far as I know it hasn’t been changed significantly. 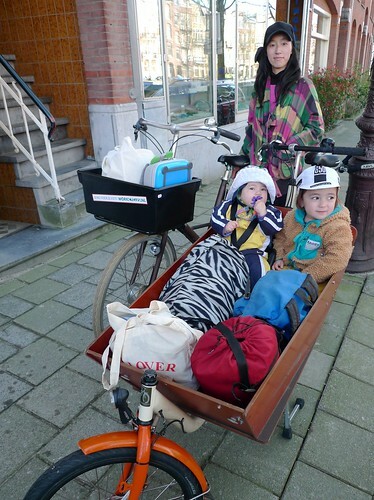 Really our regular cargobike tent made by Clarijs works very well for our conditions. I cannot imagine that the weather in Hull, right across the North Sea, has weather significantly different from here in Amsterdam. Very interesting article and inspiring! I live on the West Coast of Canada on Vancouver Island. 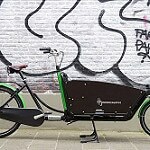 As a mom of two young ones (2 and 4), I would like a cargo bike but cannot find one. Do you have any suggestions about where to get one like yours with the cabrio raincover as we get our fair share of rain here. Thanks for the inspiration! The Kr8 is much lighter and generally more advanced than other cargo bikes and it also flat-packs for international shipping. We have a bakfiets long in the UK and our son is nearly a year old. Wondering whether to go straight from the maxi cosi to the bench or via the toddler seat on the bench. It seems quite expensive but the advantages I can see are head support, slight recline, tighter straps and maybe a bit of side impact protection. Do you know of any resources going through pros and cons and what is your opinion? Ilana, Judging from how boneless my kids were at that age your son will need some extra support for a while. It’s just about keeping the child upright and comfortable and not slipping out of the harness. 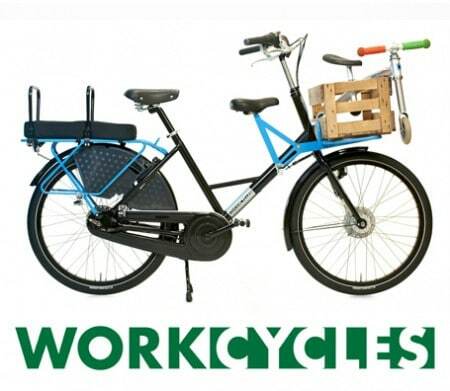 The WorkCycles setup is good and conveniently available but if money’s tight you could get the same result in many other (cheaper or free) ways. I’ve gone for the new multifunction tent. Very pleased with it. So far I haven’t needed to remove it at all, just open the sides in milder weather. Furthest I’ve gone is 14 miles around my home in very flat Hull, in one day. Need to build up to touring I think! Henry, love this site. 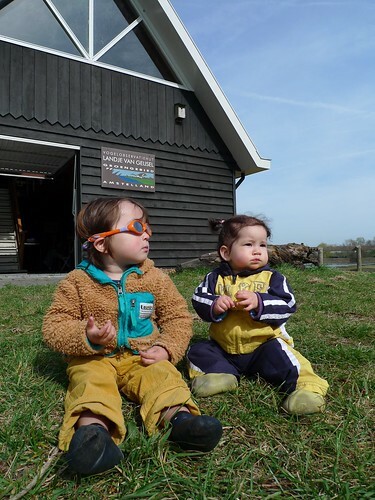 What gear and daily distances would you recommend for a self-supported Holland tour, now that our kids are relatively big (13, 10 and 9)? The 10-year old is strong as an ox, did his first 20-mile ride at age 8. By contrast, the 9-year-old probably needs to be towed most of the way (but makes up for it in general cuteness). We’re in California, and have dreamed of this trip since before we had children, ~15 years. Any suggestions appreciated. 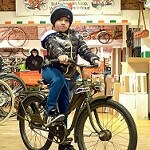 We’re currently building bikes for a family with three kids collectively a little younger than yours to ride around the world, beginning this summer. They’ve been WorkCycles customers since the kids were toddlers and the parents did an around the world tour before the kids came into the scene. The youngest child is also nine. Everybody will ride their own bike. 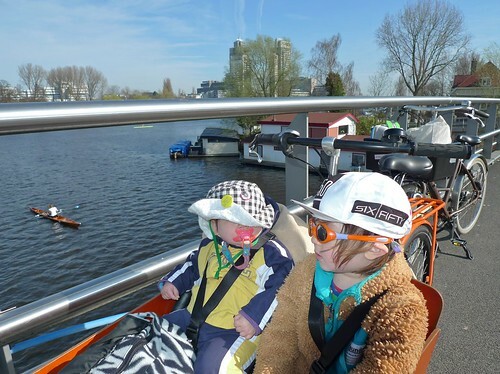 I hope I don’t sound arrogant suggesting that if these kids can do a tour of this magnitude (and I’m fairly sure they’ll be successful since the parents are smart folks who’ve done their research thoroughly), then your kids can ride around flat Netherlands. The distances are never great here so there’s no hurry. P1’s now almost six and can up to a couple hours a day at a “comfortable for parents” pace. Thirty or so km/day should be no problem for him now. Bill, how ’bout full-size bikes for the two adults and ten year old and a tandem for the 13 and 9? So great that your boy was touring on his own bike at that age. Maybe we can be a little less conservative than I was thinking. Our 9-yo has never gone more than 15km, flat terrain — enthusiastic, often suggests we ride, yet physically weak compared to our other kids at that age. Then again, maybe we just don’t ride enough. Assuming your daughter is able-bodied she can ride these kinds of distances at her pace in moderate terrain. I realize it sounds unfathomable to us but it is actually also possible that she just doesn’t like bike touring. That could just be her nature or a result of the local conditions, or how your family rides or…? A huge change of scenery and conditions might change that, or it might not. True, and that’s a somewhat testable hypothesis. We live in one of the few US cities with over 100km of off-street bike paths. So it’s low stress, but just OK scenery, nothing like what you guys have. Maybe we could try a short tour here, then another in Eugene Oregon (another place with a lot of off-street paths, and better scenery than ours). If that works, then we try the big upgrade. We’re in Sydney & have a new bakfiets, my daughter STIs in a maxi cost in the box (she’s 3 months) and she cries over every bump. Is here a way to make it more comfortable for her? Kristina, That seems strange that your daughter cries over each bump. We’ve sold thousands of these bikes and our own kids have grown up riding in them, and I haven’t heard this before. You don’t say what bike it is nor how the Maxi-Cosi is being held in the box. Three-wheelers tend to be very harsh riding up front because the children sit almost directly over the front axle and there is no flex in the frame to absorb shocks. Regardless of the bike type the front tire(s) should be very, very soft. Basically you can pump the front tire(s) just hard enough to steer OK and to avoid getting pinch flats. How is the Maxi-Cosi secured in the box? 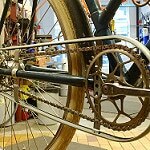 It must be fairly softly connected, such as on the WorkCycles MC bridge with a thick, soft cushion between the MC and the bridge. Finally, you simply have to ride slowly and avoid sharp bumps with a baby in the box.